DID YOU KNOW? SERVPRO of Woodbury/Deptford provides 24 hour emergency response and additional services to help customers with Fire & Water - Cleanup & Restoration and Mold Remediation! Board-ups/Roof Tarping/Property Securing - In some cases it may be important to secure openings to your home or structure using sturdy, durable materials designed to protect it from both weather intrusion and intrusion by outsiders. SERVPRO of Woodbury/Deptford Professionals may perform the board-up and tarping themselves, or outside subcontractors may be utilized. Move-Outs - If prolonged exposure to the loss event could cause additional damage to your contents, your contractor requests relocation of the contents, or the safety of your contents is a concern, a move-out may be recommended. In these situations, SERVPRO of Woodbury/Deptford are trained to properly inventory, move out and control the contents from the structure during the cleaning, restoration and deodorization process. Reconstruction Services - Once the damaged materials are removed from your home or business other construction may be needed to restore your property to preloss condition. Your local SERVPRO of Woodbury/Deptford Professional is trained with the proper equipment to replace flooring, carpet, tile, hardwood floors, and doors. We can paint many surfaces, work on ceilings, trim, bathroom/kitchen remodels and home/office renovations. Inventory - Utilizing Contents Claim Inventory Service technology, SERVPRO of Woodbury/Deptford can generate comprehensive room-by-room inventories. Contents are categorized as salvageable, non-salvageable and questionable - allowing for easier contents settlement. Electronics Cleaning and Restoration - Smoke residues can contain acids that corrode metal surfaces when moisture is also present. If the residues are not removed, corrosion can eat away at the metal casing and can ultimately cause electronic failure in the device. A SERVPRO of Woodbury/Deptford can clean the outside casing correctly, as well as refer your equipment to a qualified electronics vendor. For all of your restoration needs, contact the Franchise Professionals at SERVPRO of Woodbury/Deptford today! Call 856-686-0100 . We make it, "Like it never even happened." Specific steps can be taken to reduce property destruction, prevent additional water damage and restore your property. Your selection of water restoration technicians should be certified and trained in current procedures in order to dry the entire structure as quickly as possible by utilizing state-of-the-art equipment and technology. In addition, moisture meters are needed to locate moisture invisible to the eyes, such as behind walls or cabinets, where dangerous mold can grow. When water damage of any kind strikes, time is of the essence. By acting within the first 24 – 48 hours of the damage, homeowners can prevent permanent destruction and reduce repair costs. Water problems are a nightmare for homeowners, especially when those problems lead to significant flooding. Dealing with water or flood damage is time-consuming, expensive and isn’t always covered byhomeowners insurance. Depending on the amount of damage, restoration can cost between $1,400 – $7,500. Vacation Time Is Approaching, Are You Ready to Go? If you come back from vacation and encounter damage within your home, call SERVPRO of Woodbury/Deptford 856.686.0100. We clean up mold, fire or water damage to your home or business in Woodbury/Deptford and surrounding areas. Water damage can be deceptive. In 2011, an estimated 16,400 non-home structure fires reported to U.S. fire departments involved some type of electrical failure or malfunction as a factor contributing to ignition. These fires resulted in 13 civilian deaths, 243 civilian injuries, and $501 million in direct property damage. In 2007-2011, non-home electrical fires represented 13% of total non-home structure fires, 5% of associated civilian deaths, 13% of associated civilian injuries, and 21% of associated direct property damage. The national estimates in this report are derived from data reported to the U.S. Fire Administration’s National Fire Incident Reporting System (NFIRS). These statistics include fires reported as “confined fires,” for which detailed reporting is not required. Estimates of detailed characteristics for confined fires require statistical allocation of a large share of unknowns and so involve less confidence. Half (48%) of 2007-2011 reported non-confined U.S. home structure fires involving electrical failure or malfunction had some type of electrical distribution or lighting equipment as equipment involved in ignition. The leading other types of equipment involved in ignition were fan (6%), washer or dryer (6%), space heater (4%), air conditioning equipment (4%), water heater (3%), and range (3%). A leak from a refrigerator line caused mold damage to the laminate flooring in this kitchen all the way down to the subfloor, pictured here. SERVPRO of Woodbury/Deptford responded to a call for mold remediation in Deptford, New Jersey. The ice maker line in the refrigerator was leaking for an unknown length of time. As a result, the floor and cabinets were wet. As soon as the homeowner discovered the floors were wet, he called SERVPRO of Woodbury/Deptford. 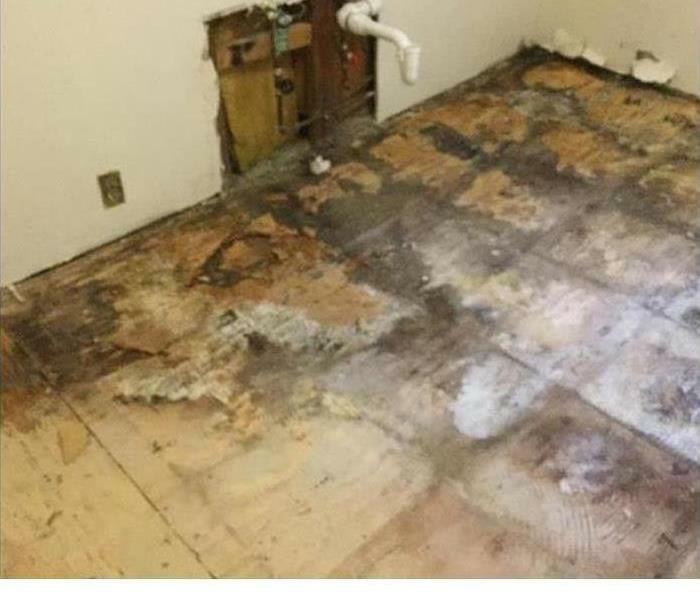 Upon tearing out the kitchen floor, our technicians learned that the subfloor was also effected by mold and had to come out, along with the cabinets. The wood in the subfloor and the cabinets is a food source for mold. In order to grown, mold requires an organic material to feed on, sustained moisture, and time. This Deptford kitchen met these requirements. The kitchen was approximately 150 square feet. SERVPRO of Woodbury/Deptford set up an air scrubber and dehumidifier within the containment in order to properly clean the space. The family could not use their kitchen for the three days our company was working, but they were not displaced from their home. After the tear out, we vacuumed the space with a HEPA vacuum to catch any errant mold spores from the remaining surfaces in the kitchen. So as you can see, a small leak that goes undetected for a period of time can cause major damage! Make sure you have someone to call as soon as you notice a problem. SERVPRO of Woodbury/Deptford responds to all emergency cleanups 24/7. Home deodorization in Woodbury/Deptford, NJ, can be a challenge, especially if you or a family member smokes. Whether you are getting ready to host friends or family members or you just want to be ready for unexpected company, here are a few surprising things you can do to reduce the smell of cigarette smoke in your furniture and carpets and throughout your home. Vinegar might not be the first thing that comes to mind when you think of cigarette removal, but it’s very good at removing stubborn scents from a variety of fabrics. If you have pillow cases, blankets or decorative throws that are saturated with the scent of your cigarettes, throw them in the wash with two cups of vinegar. Then put them through a regular drying cycle. You’ll be surprised at how fresh-smelling they are when you pull them out. If the smell of cigarette smoke lingers, wash them once more to get rid of it completely. Baking soda is a well-known air-freshening tool. It’s frequently used in refrigerators to soak up the smell of old, rotten food. You can also use it to absorb the smell of stale cigarette smoke. For home deodorization purposes, sprinkle baking soda on all soft furniture surfaces in your home. It won’t work very well on leather, but it should work great on fabric furniture. After sprinkling generously across all furniture, use your hands to smooth it out and make it disappear into the fabric. After letting it sit for at least 10 minutes, vacuum it up. You can use the same technique on carpets, rugs and drapes. In some cases, cigarette odor is so pervasive that it can’t be removed with simple cleaning methods. In this case, may want to consider repainting your home or replacing old, smelly carpets if the scent bothers you enough. If you have tried the above steps and you still have an odor, try calling professional restoration services. They have the tools and expertise necessary to handle your home deodorization needs. 3/27/2019 - Vacation Time Is Approaching, Are You Ready to Go? 3/26/2019 - Water damage can be deceptive.